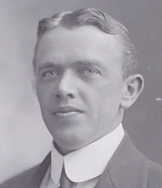 My father, Adolf Hamann, was born in Hamburg, Germany, in 1884. His father was pastor of a Lutheran church, and his mother died while he was still young. My grandfather married again and that caused some unhappiness with my father when he was young. So in 1904, at about the age of 20, he took a ship for South America. He lived in Antofagasta, Chile, until 1908 when he transferred to Lima, Peru, and lived there until 1944, when he was deported. He married my mother about 1919. I remember hearing my mother and father say that the marriage had not been permitted by my mother’s father during WW 1 because of him being a German. So they married only after the war. My father returned to Germany only once, for about four or five months on a family visit, in 1926. He fathered seven children, three girls and four boys. I am the second of the boys, the third in the family. His business in Lima was import/export. He imported goods from Germany, mainly hardware goods, like pencils, knifes, wire etc. He also got involved in some mining ventures. He talked a lot about his mines and about the need to bring a Geologist to study them. The mines were antimony (molybdenum), silver, and lead. As far as I know, those mines never went into production, because the war stopped it all. 1939 brought the war and his firm was among the very first to get on the Black List. This list existed in Lima by the name of “Lista Negra”. They were businesses with which nobody could deal. The list was published; it was not a secret. Who put it out I do not know. I imagine it was either the British, the Peruvian government, or the American government. Nobody could make any business contact with a member of the black list under the risk of being himself put on it. So his business stopped. My father went out of business and immediately had financial problems. Also, not having anything to do affected him very much. He was very bitter. The people avoided him in the street; they would not even say hello. They were all afraid of having anything to do with him because of the black list. He was nearly 55 years old, and he would walk a lot along the beach feeling depressed. Then the deportation of Germans in Peru started. My father was in one of the last groups to be deported. I remember that suddenly we had two plainclothes policemen in front of our door at all times. We knew about a week or two before his deportation in March of 1944 that he was to be deported. He was sort of glad because he was so unhappy, seeing all of his life destroyed by the war. The deportation itself was very peaceful. I remember going with him to Callao – the main port of Peru. At 7:30 A.M. March 1, 1944, American and Peruvian officials began loading 411 enemy aliens aboard the U.S.A.T. Cuba at Callao. Besides the 339 Japanese, 72 Germans, including my father, trudged up the gangplank. An American embassy official described the operation as “one of the most successful of the various deportation proceedings undertaken”, with “very few last minute escapes”. This he attributed to the deportees being able to take their wives and children along. 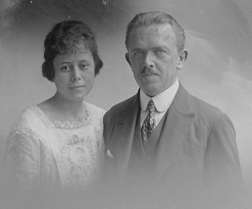 But Hamann’s wife was among approximately 50 German wives who chose not to accompany their husbands “because of fear to be send to Germany”. 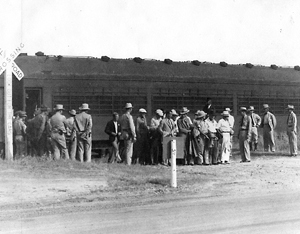 German internees arriving at Camp Kenedy. 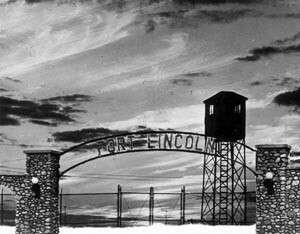 My father arrived at Camp Kenedy Internment camp in Texas on March 22, accompanied by a State Department representative. On the 12th of April, in order to get some spending money from the German government, made available through the Swiss protecting power, he signed a statement-required by Germany before any money could be allocated- that he was “loyal to the German Reich”! and willing to go back to Germany at the first opportunity” Almost immediately he began to complain about his deteriorating health. We received correspondence regularly and we could write to him. His only complain was that it was awfully hot. On January 7, 1945 my father was sent back to Germany on the Gripsholm, a Swedish ship. He settled in Kellinghusen, a town in Schleswig-Holstein in northern Germany. In April, he went to Hamburg to visit his sister who had been wounded in a bombing raid. While at the hospital there he had a heart attack and died on April 25th. We did not find out about his fate until a full year later, in May 1946 when mail was reestablished with Germany. My family still lives in Lima, I stayed there until 1948. In 1947, I started to study geology at the University of San Marcos in Lima and in 1948 I was fortunate to be sent on a scholarship to Venezuela. In 1952 I married a Venezuelan, returned to Lima and started working for an American oil company. I came to the USA for the first time in 1954, sent by the oil-company. I liked it so well here that I decided to quit the company and immigrate to the United States. I enrolled at the Stanford University, graduated, and have worked all my life in Petroleum Geology. I always have been curious to know why they deported my father. Was he accused of something other than simply being a German? Now, 78 years old, I still do not have an answer. Please help me.